We were living “typical-normal” lives. We were living in Cameron, TX where Chris was a superintendent for a construction company, and I was a high school math teacher. In the summer of 2012 mission work was particularly on my heart. I shared this with Chris and he suggested that we pray about it and ask God to reveal His will to us. So we prayed, a lot… and then we went to church a week later. There in the church bulletin was an announcement from one of our elders, Kent Dale, about a Ukraine mission trip. We knew the Dale’s from earlier years, the trip was in June when I would be out of school for the summer, it was only 10 days and Chris had enough vacation time to go. All of these things made the trip doable for us but God spoke louder to us than just the scheduling. The announcement said that they needed people to help build a chicken coop. Now a chicken coop might not seem like the words of God to just anyone but to us they did. First off Chris is in construction, he has built me many chicken coops over the years and this was a way for him to be effective without being a “preacher”. To me, chickens have always been a part of my life. I have raised them, loved them, hypnotized them, majored in them in college, and worked with them at the A&M Poultry Science Farm. You’ve heard of a “crazy old cat lady”… Well my mom is a “crazy chicken lady”. And the connections to chickens just go on from there. We felt like God had just hit us over the head and made it obvious that He wanted us to be a part of this trip. So we went to Ukraine. We learned of the problems that face older orphans and knew it was something we had to help with. Now we work full time in ministry with a nonprofit, Program for Humanitarian Aid. 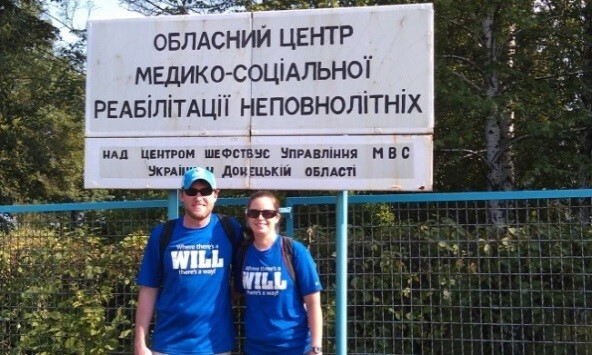 We travel to Ukraine frequently to help and serve. While we are in the States we share the story of the work and fundraise for this ministry. We never got to build the chicken coop. God just used it to get us there.